Ballymena United's 2004 side will be in action in the Foyle Cup. 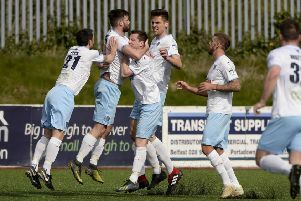 Preparations are well underway at Ballymena United Youth Academy, for the incoming season with all the club’s national league sides competing in the top flight of youth football this season for the first time. The under 13s, 14s and 15s will compete against other Irish League academies and top boys clubs as the sky blue sides look to continue last season’s fine form. At senior level the under 16s will also compete in the premier league this season as these young players look to continue their progression to 17s, youth, reserve and eventually the senior stage. The opening weekend’s fixtures have thrown up some exciting ties for the United youth sides, the under 13s are away to Lurgan and a number of new faces have joined this ever improving squad who showed their potential with a friendly win over a talented Glentoran side at the Showgrounds last Monday night. The under 14s are still finalising their own squad as they make their debut in the premier division this year and will again look to continue their exciting trademark football from the last campaign. Gary Twigg’s under 15s will also be hoping to continue on from their good form at the end of last season, this group would still be interested to hear from any boy who believes he could contribute to the squad, and play at this higher level. If you would like to be coached by one of the Irish League top strikers and have a chance of playing at the highest local level, contact any official at the club, details can be found on the website at www.pitchero.com/clubs/ballymenayouthacademy. United under 11’s and under 12’s will compete next season in the renowned Lisburn Invitational Youth League, in which they have been ever-present for many years, again against many of the top academies and boys’ clubs. Before that the 2004s will fly the flag at the Foyle Cup where Davy Douglas’ boys will hope to impress.